Last June at one of our modern quilt guild meetings, one of our members shared her ‘refrigerator quilts’. 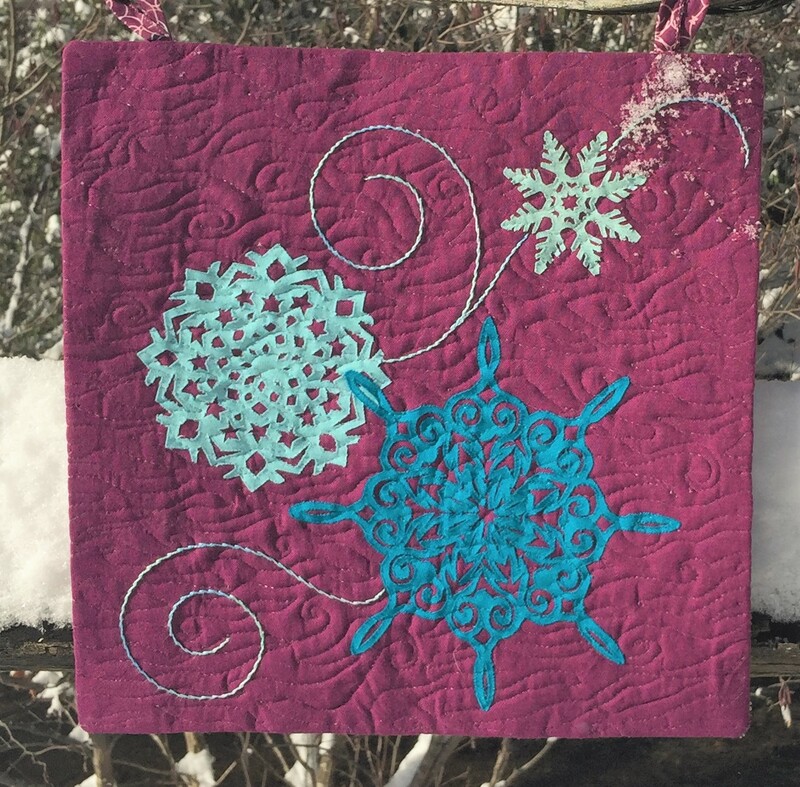 She was making one small quilt a week (around 12″ square) to hang on her refrigerator. 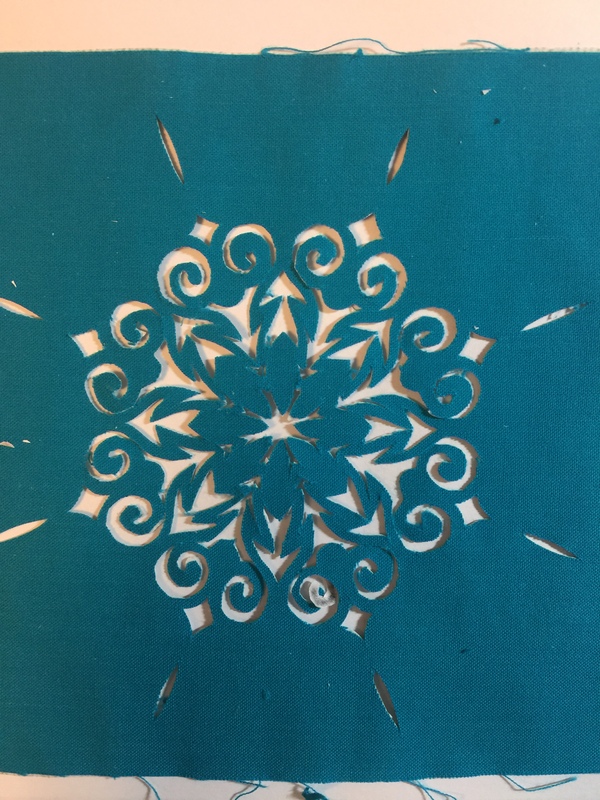 Since small quilts take less time, it’s easy to try a variety of techniques without being fully committed with a large quilt. 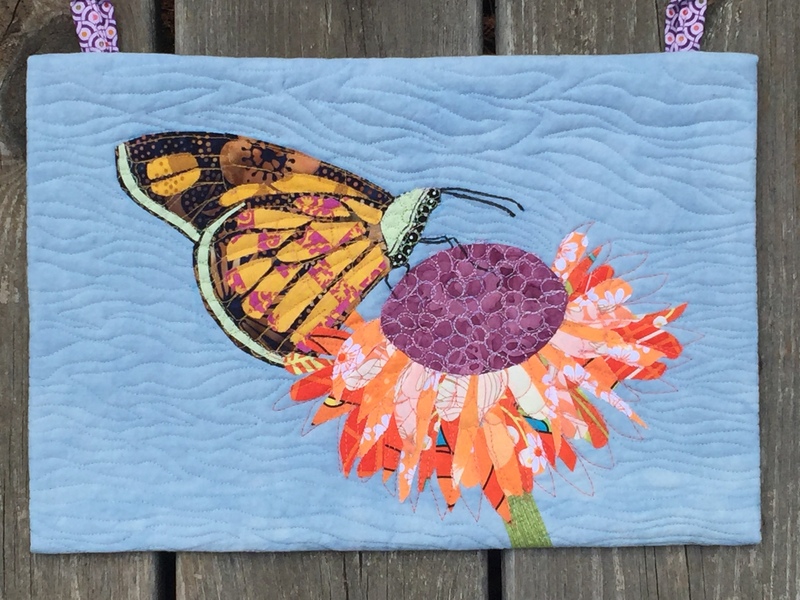 Our challenge that month was to make a refrigerator quilt, so made this cute butterfly and sunflower quilt out of my fabric scraps. It is all applique and measures 9-1/2 x 12-1/2. It’s hung on my refrigerator since then. But now it’s winter and I need something on the refrigerator that matches the season better. Enter Project Quilting Season 8. 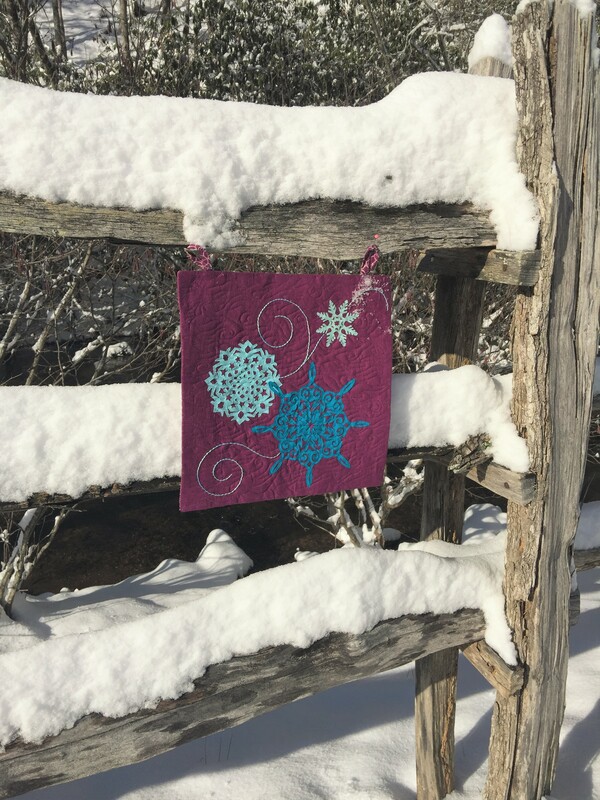 Hosted by Persimon Dreams, Project Quilting starts January 1st each year and is a total of 6 challenges every other week based on the theme for that week. This weeks theme is “Eight is Great”. The challenge is to create a project that has something to do with the number “8”. I thought this challenge series would be a great opportunity to make more refrigerator quilts. 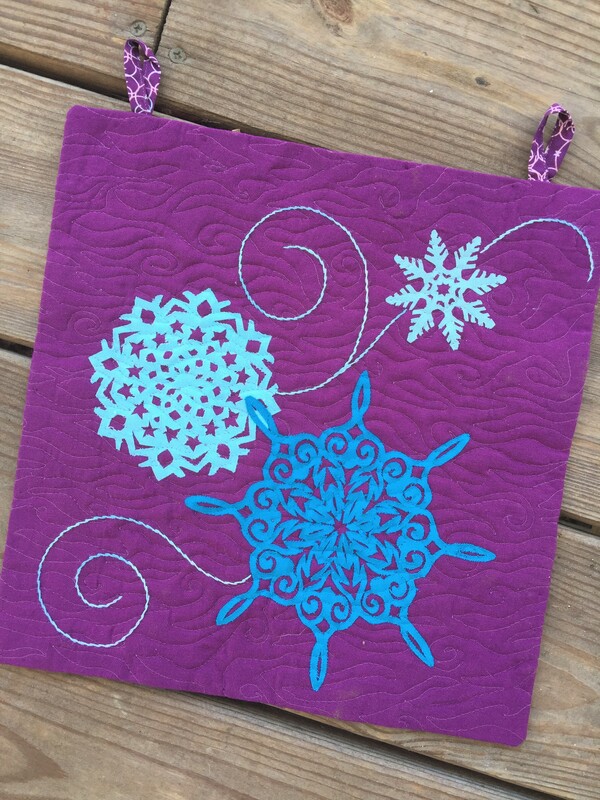 For this first challenge, I decided to make 8-pointed snowflakes. Just in time too, for the big snowstorm we got last night. I free motion quilted all over, and then add hand embroidered ‘wind’ swirls. It finishes at 11″ square. The front fabrics are all Cirrus Solids by Cloud 9 fabrics. Part of the fat quarter pack I won almost two years ago here. The quilting is done in Aurifil clear poly thread. The back is an Art Gallery print that just matched it perfectly. 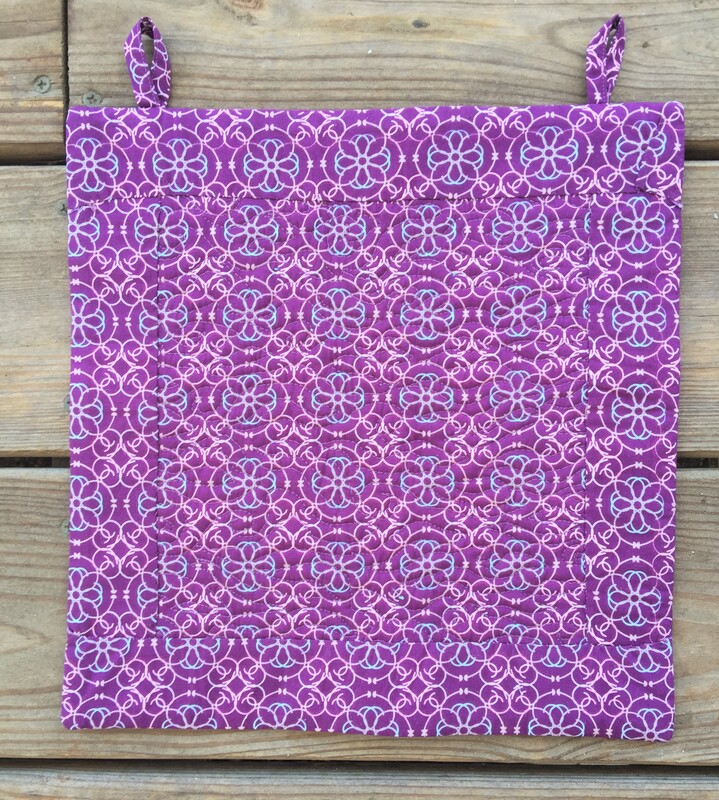 I hate using such nice fabric for the back of anything, but it matched so perfectly I just had to. This was super fun! I can’t wait to see what the next challenge will be. Linking up with Finish it Friday at Crazy Mom Quilts, Can I Get a Whoop Whoop at Confessions of a Fabric Addict, and Project Quilting Season 8 at Persimon Dreams.